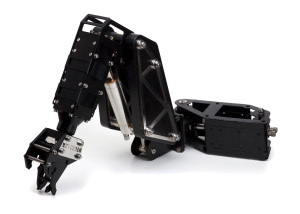 The HLK-43000 Mini Gauntlet Arm is a five function lightweight arm, designed for small ROV's. The stainless steel jaws incorporate a 180°; jaw rotate with a 1 / 4 " diameter rope cutter. 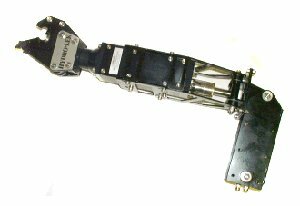 This arm has been designed to work with Hydro-Lek's HLK-70150 5 Way Valve Pack and HLK-91000 DC Power Pack. 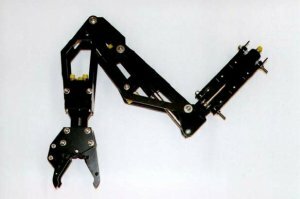 The HLK-MB4 Manipulator arm is a utility class arm ideally suited for installation on many of the smaller ROV's. It is extremely compact and has a lift capacity of 40kg. It utilizes the HLK-2020 Continuous Rotate Jaw Actuator and HLK-1300 Hydraulic Cylinders. The HLK-EH5 is a compact stowable arm, which has a reach of almost 800mm. Constructed from 316 SS and HE 30 Aluminium, it incorporates the HLK-2010 Jaw Actuator and three HLK-1300 Cylinders. ROV's fitted include Argus, Recon, Surveyor, Panther and Sperre. A rugged work-class arm for the smaller ROV, this arm is constructed from 316 SS, HE30 Aluminium and High Density Polyethylene, it incorporates the HLK-2020 Continuous Jaw Rotate Assembly and three HLK-1300 Cylinders. 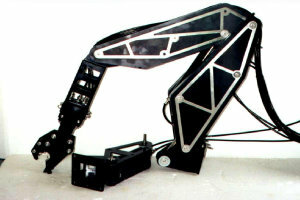 The arm is capable of lifting over 50Kg at a full reach of 800mm. ROV's fitted include MAX ROV and Panther. A long reach, light weight arm being only 14Kg in water. With a reach of over 1400mm it can lift 30kg. Designed to collect sea bed samples, it can also be used as an extended camera or lighting platform. It incorporates the HLK-2010 Jaw Assembly and four HLK-1300 Cylinders. 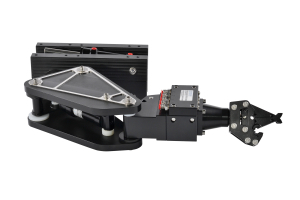 The HLK-HD6W Manipulator arm is based on the HLK-HD5, but with an HLK-22100 Rotary Actuator fitted at the shoulder joint, which is mountable in 4 separate positions to allow port & starboard mounting as well as offering additional up or down functions. 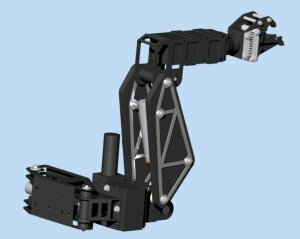 This arm has similar geometry to the HLK-HD5 Manipulator arm but with increased lifting capacity. It incorporates 35mm bore cylinders (HLK-13020) and capable of lifting 90Kg at 175 BAR hydraulic pressure. It also has the HLK-2020 continuous rotate jaw fitted.